If you’re lucky to call the Georgian Ridge Subdivision in Johns Creek, GA home then you can also call it your center for a lifetime of fun and activity! Whether you are a walker, jogger, an aficionado of food or dog lover Johns Creek and North Fulton has an array of things to do, experience and enjoy. Within a short walk or wide you have a multitude of opportunities at Newtown Park. This park offers many athletic and recreational options including walking trails, baseball/softball fields, tennis courts and picnic spots for outdoor picnics. 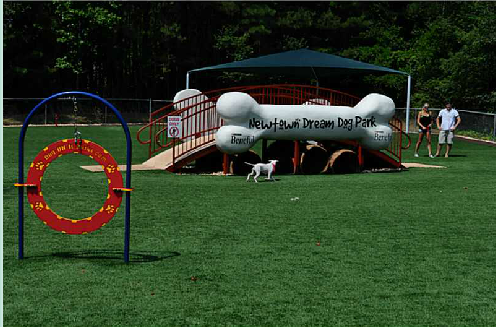 Newtown Dream Dog Park, one of the top dog parks in the country, is located inside Newtown Park. It features sprinklers for dogs to play in, an obstacle course, water fountains for both pets and their owners, as well as plenty of shade and benches. It was specifically developed for hours of entertainment by both the large and small dog. During the summer months Saturday mornings are a buzz of activity at Newtown Park with its’ Farmer’s Market. Local farmers and vendors of organic and/or sustainable foods and produce bring their wears to the park for the community to experience and purchase first hand. Also during the summer there are “Movies at Newtown Park.” This is a summer outdoor series of family-friendly movies presented on a huge inflatable screen at the park. Prior to the movie there is a host of pre-show activities including inflatable moonwalk, face painting, children’s activities, giveaways, entertainment, food and drinks, along with displays from local businesses/organizations. Georgian Ridge Subdivision in Johns Creek, GA – Welcome Home! Ready to settle into Johns Creek? This is a must see jewel nestled off Brumbelow Road. Newly updated kitchen and other amenities offers the room for any family to settle in and enjoy a lifetime in this home. Link here to experience this home. The Georgian Ridge Subdivision in Johns Creek, GA offers quite streets and access to activities and a lifestyle any homeowner will enjoy. Johns Creek, GA lies along the banks of the historic Chattahoochee River offering limitless hours of recreation. The Georgian Ridge Subdivision is close enough to the city of Atlanta to take advantage of the vibrant culture and business, yet far enough away to experience the quiet side of life. Make plans to see this home – contact Janet, Keller Williams Realty, First Atlanta.